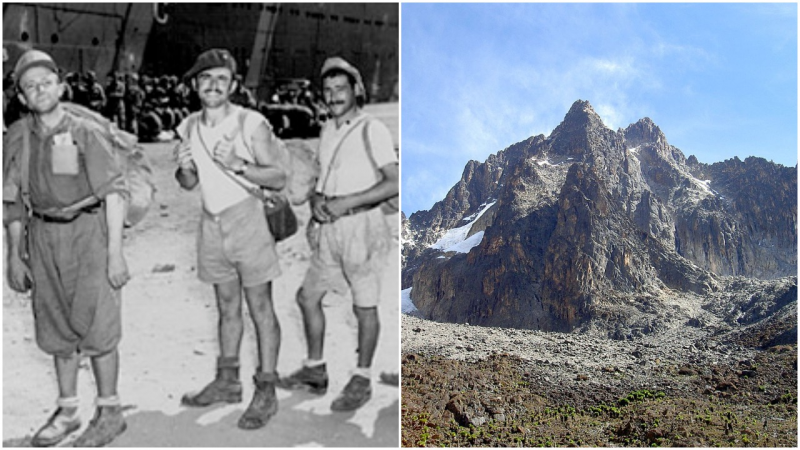 Three Italian PoWs Broke Out of a PoW Camp, Not to Escape But to Climb Mount Kenya For Fun! When a prisoner of war concocts a plan to escape the prison camp in which he is incarcerated, his greatest is fear is usually being caught and brought back. Planning to break out and then return to the prison camp from which he has just escaped must seem like an absolutely insane – if not downright suicidal – plan of action. Yet that is precisely what three Italian prisoners of war managed to do. 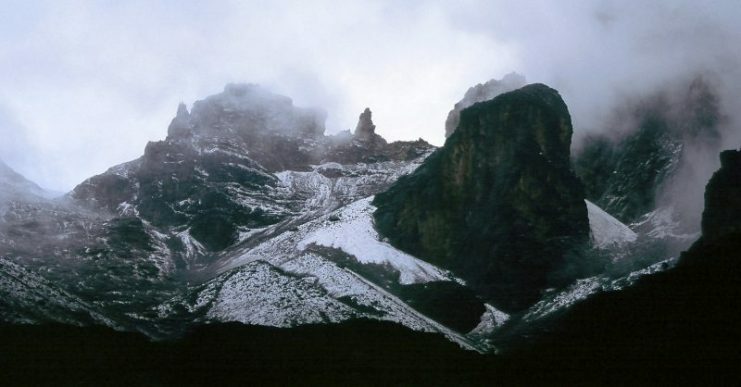 They were incarcerated at a British POW camp in Kenya, and the aim of their audacious plan was not to get back to Italy but to climb Mount Kenya, the second highest mountain in Africa. Once they had completed their goal, they returned to the prison camp and handed themselves over to the British. 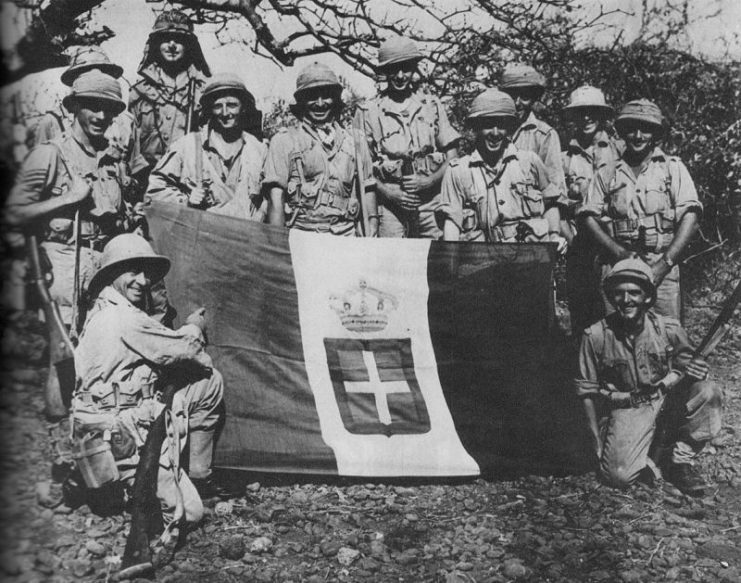 South African soldiers with a captured Italian flag, 1941. In times of war, the third worst fate that can befall a soldier (after death or serious maiming) is being captured by the enemy. Throughout the history of warfare, camps for prisoners of war have been notoriously horrific places in which captured soldiers often died from exposure, starvation, or simply being worked or tortured to death. However, not all prison camps were this awful. During the Second World War, prisoners in British POW camps in Kenya (a British colony at the time) had a miserable time not due to torture, measly rations, or horrific living conditions – but due to boredom. The Italian prisoners were generally treated well, and fed and housed in decent conditions. However, there was very little to occupy the men, and dealing with the constant boredom was quite a challenge. Giovanni Balletto, Vincenzo Barsotti, and Felice Benuzzi were three prisoners in Camp 354 in Nanyuki. 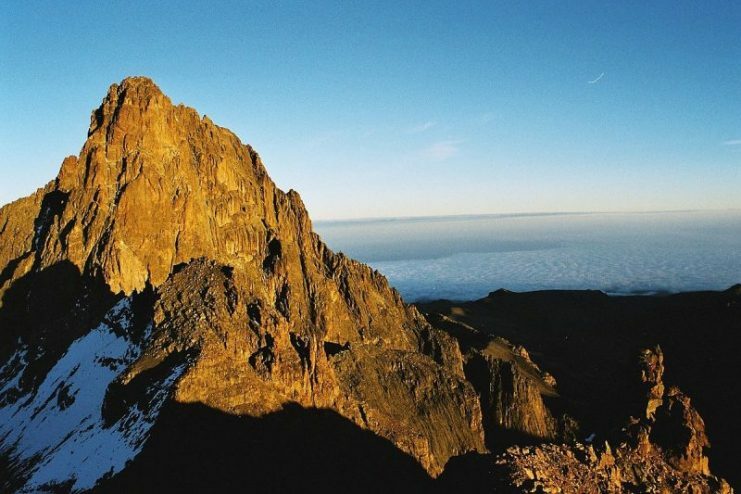 They came up with a bold, if reckless, plan to combat their boredom: they intended to break out of camp and scale Mount Kenya. There were three major challenges to overcome in terms of completing their objective, and all were fraught with danger. The first, obviously, was breaking out of the camp, a risky enough endeavor on its own. The second was getting to the mountain through enemy territory – and not just any enemy territory, but the wilds of Kenya, full of dangerous animals like lions, elephants, African buffalo, rhinoceroses, and venomous snakes. The final hurdle was climbing the mountain itself, which was no mean feat, as it rose 5199 meters (just over 17,000 feet) above sea level. It would be extremely challenging even to experienced mountaineers – which these three POWs were certainly not. Felice Benuzzi was the prisoner who came up with the idea. He first approached a fellow POW who happened to be a skilled and experienced mountaineer. The man scoffed at the plan, saying there was no way any inexperienced climber could possibly attempt such a feat, especially seeing as they had zero mountaineering equipment. However, Benuzzi was determined to go through with his plan and did not let the mountaineer’s criticism get in his way. He next approached Giovanni Balleto and Vincenzo Barsotti, who were eager to join the expedition. Balleto had a little amateur mountaineering experience in the Alps, as did Benuzzi. Barsotti had none, but he was raring for an adventure. For such a daring plan to succeed, plenty of planning and preparation was necessary. The three prisoners spent eight months getting everything ready. Using scrap materials, they stitched together their own backpacks. They stole hammers from the prison workshop and cold-forged them into ice picks. Items salvaged from the trash were used to make crampons. Abunk cot was taken apart, the cords joined together to make a length of rope. 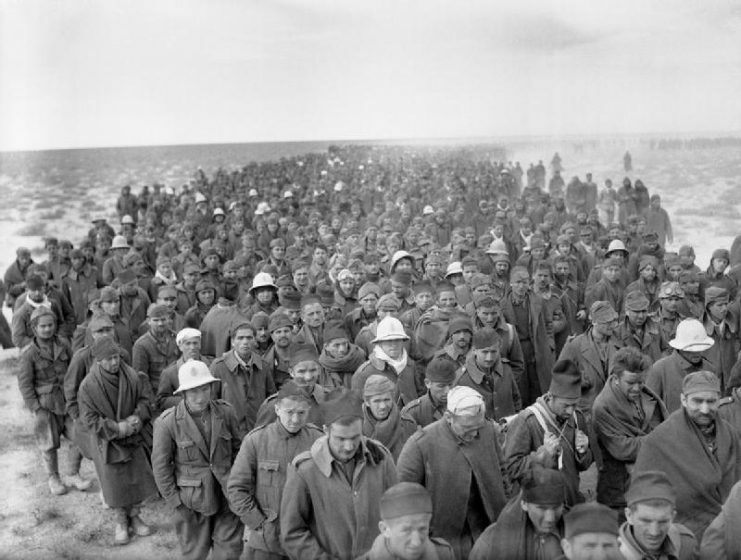 A column of Italian prisoners captured by the British Army. The men knew very well that they would need a decent supply of food for their expedition, so in the weeks before the planned escape date, they began storing hard-boiled eggs, tinned beef, dried fruit, and cookies. Some of these were taken from their own rations, the rest they obtained from other prisoners by quitting smoking and trading their weekly cigarette rations. In a daring move, Benuzzi managed to sneak into the camp commandant’s tent and make an imprint of the gate key in a lump of tar. With the assistance of a fellow prisoner who was a mechanic, he forged a copy. They used the key to sneak out and bury their food and equipment outside the camp. 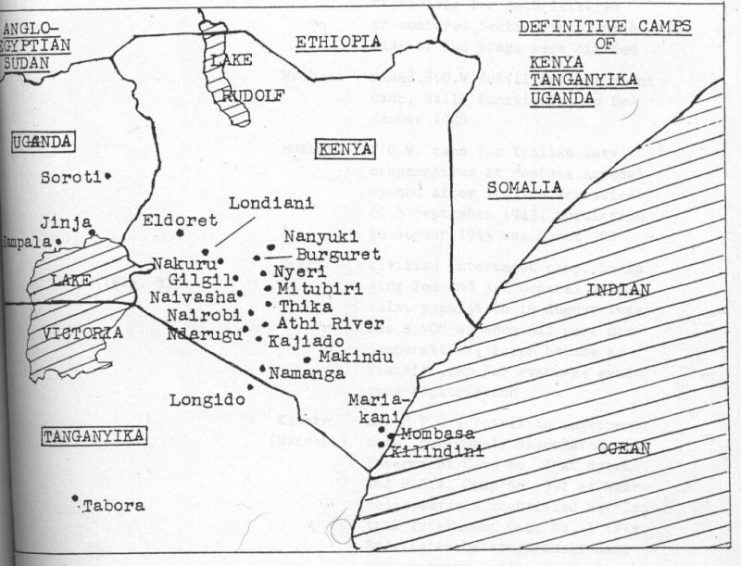 The day of the escape was scheduled for January 24th, 1943 – the height of summer in Kenya. They used the key to escape into the camp garden, in which there was a small tool shed. They hid in the shed until darkness fell, and then they slipped away into the night. Their absence was later discovered, and the escape was confirmed when the commandant found a note addressed to him in which Benuzzi promised that he and the others would return when they had completed their adventure. Benuzzi and his companions had to cover a lot of ground quickly while avoiding leaving a trail for the British to follow. 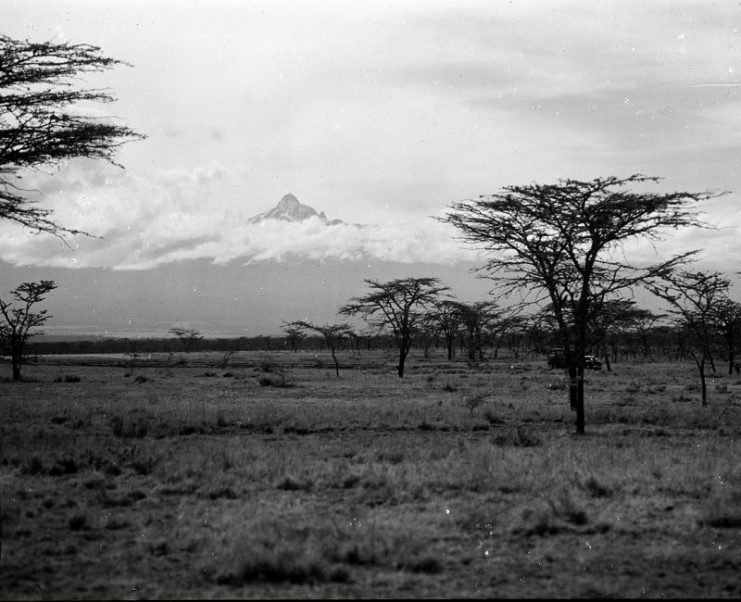 They did this by moving through the bamboo forests in the foothills of the northwestern ridge of Mount Kenya. The only map they had to follow was a detailed picture of the mountain they had peeled off an empty food tin they had found in the trash. Against all the odds, they managed to reach the mountain after a few days and began their climb. Barsotti, a chain-smoker, ran out of breath and had to stop by the time they had gotten 4257 meters (13,966 feet) up the mountain. They were also beaten back by a heavy snowstorm. Benuzzi and Balleto pressed onward though, determined to reach the summit. They almost achieved this goal, reaching an altitude of 4999 meters (16,400 feet) – just 198 meters (649 feet) from the summit – where they planted a tiny Italian flag they had made and left a message in a bottle, before turning back. Eighteen days after they had escaped, they snuck back into the prison camp where they were soon discovered by the guards. After being allowed to have a shower and eat a hot meal, each man was thrown into solitary confinement as punishment for escaping. They were initially sentenced to 28 days in solitary confinement, but the camp commandant, impressed by the sheer audacity of their plan and the fact they had returned of their own free will, commuted this sentence to seven days each. The Italian flag they had planted and the bottle they had left on the mountain were later found by British mountaineers. This confirmed that, as unbelievable as it was, these three Italian POWs had almost reached the summit of Africa’s second highest mountain with makeshift equipment, little experience, and no real maps.